Donald Trump has pledged to, among other actions, cancel all federal funding to sanctuary cities and allow the construction of the Keystone Pipeline to move forward. And those are only his plans for the first 100 days, not to mention the other 1362. Contrarily, in his first 100 days in the White House, President Franklin D. Roosevelt enacted the majority of his New Deal legislation, saving our country’s economy. Similarly, President Obama enacted his stimulus package, stopping the downward economic spiral of the Great Recession. While his predecessors have chosen to use their first 100 days in office to lend needed support and protection to the American people, President Trump stands poised to use his first days to settle personal scores and bully those he sees as beneath him. 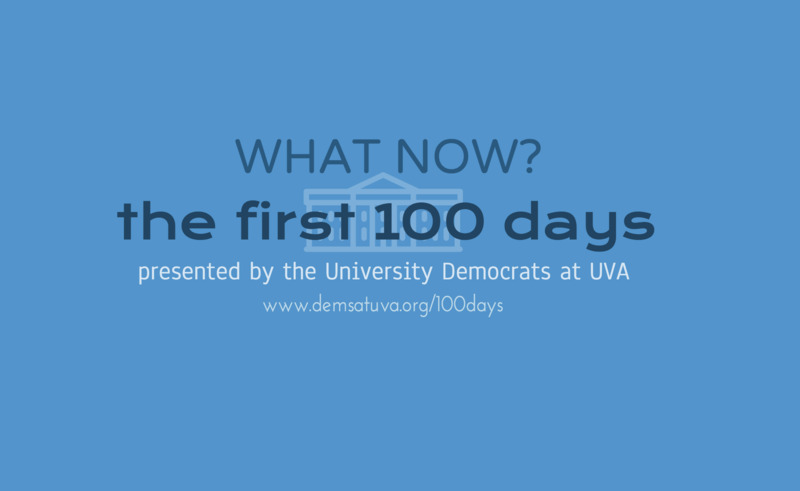 With this in mind, the University Democrats at UVA have prepared our own plan for the first 100 days of the Trump administration. Our list consists of 100 concrete actions to be undertaken by those who wish to stand in opposition to the Trump administration. During the administration's first 100 days, the University Democrats will work to provide ample opportunities for those interested to complete all of these actions. We hope that you will join us in confronting the challenge before us, because we are- and always will be- stronger together. Download Your Own PDF Copy! We'd love to watch you complete your actions! Follow along as we work through the list. 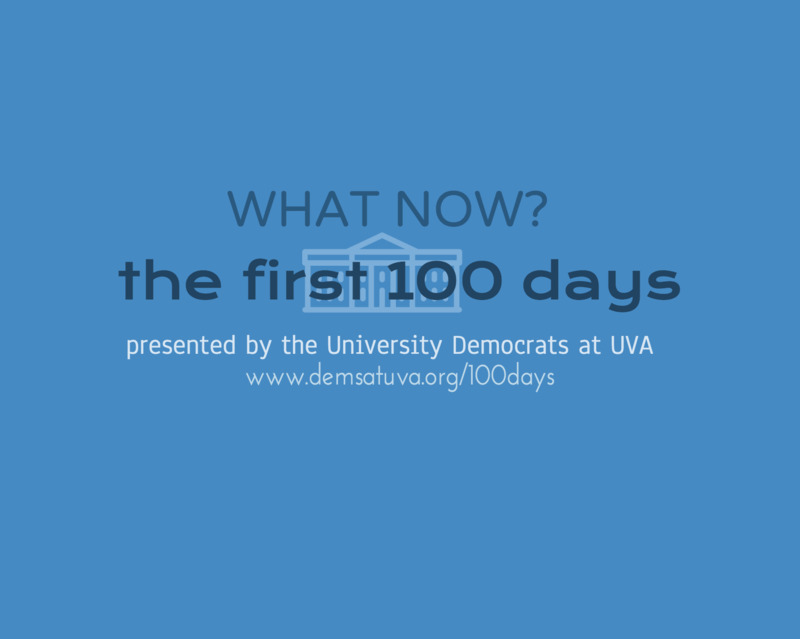 Connect with us on social media @demsatuva and tag posts #udems100days. Use any of the following images as profile pictures, cover photos, on documents, or email -- whatever works best for you works for us! Clicking each image will open them in a separate window with better quality!